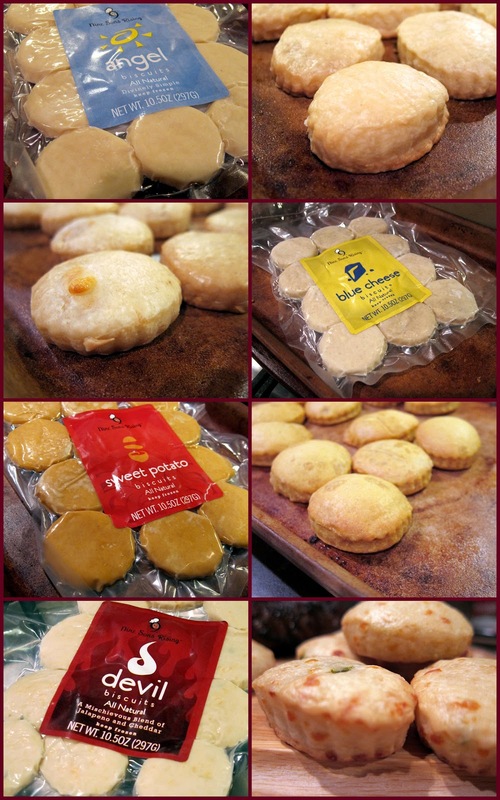 Several weeks ago, I was contacted by Nine Sons Rising to see if I would be interested in trying out their biscuits. Nine Sons Rising was founded by two mothers with nine sons between the two of them! They make gourmet biscuits, preserves and dessert toppings from all-natural, in-season ingredients and have distribution in the New York Butcher Shoppes throughout the Southeast. I had never been to the New York Butcher Shoppe in Cahaba Heights, so I was really excited to check out both! I was given vouchers to sample four biscuit flavors. I chose Angel (plain), Bleu Cheese, Sweet Potato and Devil (jalapeno jack). They were all really good! Our favorite were the Devil biscuits; they packed a nice kick from the jalapeno jack cheese. I could even see bits of jalapenos. I was really surprised at how they baked up. The are very flat in the pack, and I was worried they wouldn't bake up. But they did! They were nice and fluffy. I loved that they are baked frozen, straight out of the pack. So easy!! We had all 4 varieties with dinner, but these biscuits are perfect for entertaining. They would be great sandwiched with some ham or pork tenderloin for a quick hors d'oeuvre. I will definitely be serving these this holiday season. Our experience at the New York Butcher Shoppe was wonderful as well. They carry USDA Prime beef - we bought two NY Strips when we picked up the biscuits. They were wonderful! We enjoyed them so much that we went back and bought two hand-cut filets (and biscuits) for dinner last night. They were the best steaks that we've ever had. The New York Butcher Shoppe also carries wine, side dishes, sandwiches and specialty foods. We are their newest fans! This place is not to be missed!! If you are in The Ham - it is located in the Heights Village shopping center in Cahaba Heights (behind the Summit near Yankee Pizzeria and Dairy Queen). We have a few New York Butcher Shoppes here in Greenville too. I love going to them. I've seen these biscuits but never bought them! Good to know! We don't have the NY Butcher Shoppes but I'll keep my eyes open for the 9 Sons because the blue cheese and the Devil ones sound great to me.